In the beginning were the yarn and an entrepreneur with visions. 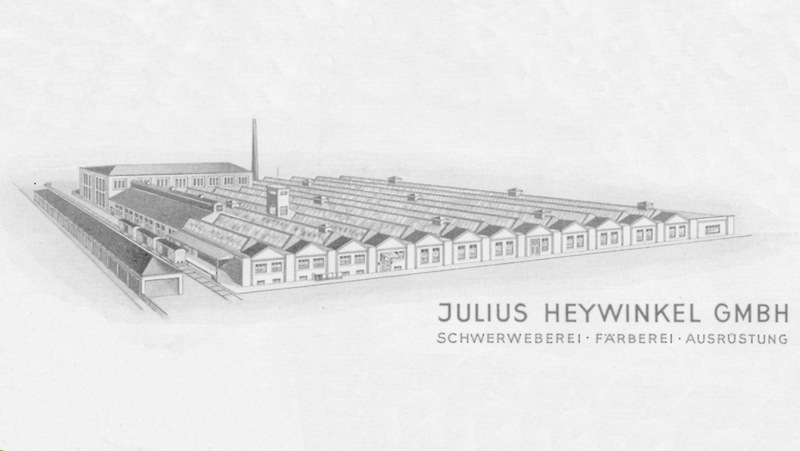 Julius Heywinkel established a sail cloth weaving mill in Osnabruck in 1913. Not only did he know his craft, but he also saw the signs of his time and managed to position the former Heywinkel GmbH so close to the market that even after the death of the founder, the gates to the world were open to the company. Expansion, innovation, change: Today’s Heytex Group has somehow always been in motion. In a highly dynamic industry as that of technical textiles, this is also part of the reasons for success. With four subsidiaries and a comprehensive product portfolio, Heytex takes an exceptional position on the world market of technical textiles today, offering ideal conditions in terms of experience, expertise and innovation for another 100 years of success! In Osnabruck, the then 35-year old Julius Heywinkel established a sail cloth weaving mill. He knew what he was talking about: up to that point he had spent his entire life in textile manufacturing. He was born in Bielefeld as the son of a weaving specialist. After his apprenticeship as a weaver he moved abroad: in Sweden he gathered a lot of experience which he used to establish his own company, Julius Heywinkel GmbH. Right from the start, technical applications and also maritime shipping were in the focus of his activities: At the time sail cloth made of cotton served as canvas, for example, for carriages and later for the first cars and was also used to cover containers. Julius Heywinkel GmbH grew rapidly and in the 1930s the company had already more than 60 employees. In the 40s, there were about 100. For a long time already, the products had not only been produced for the local market in the region of Osnabruck, but travelled to all parts of the country after leaving the weaving mill. Small and large tents from sail cloth in addition to traditional canvas. They demanded a special dyeing and impregnation process which was done at Julius Heywinkel’s own company premises. A wise decision! On the basis of his competence in dyeing and impregnation, Julius Heywinkel was able to establish his canvas weaving mill in the German market in the post-war years. One year prior to his death, the childless entrepreneur decided to secure the continued existence of his company even beyond his own lifespan by selling it to one of his biggest customers, the automotive supplier Wilhelm Karmann GmbH in Osnabruck. From then on, expansion was on the agenda and the early insight that the future belonged to the trendy material PVC. The foundation stone for the Heytex success story as a globally recognized specialist of coating was lain with the first coating plant for polyester-based fabric with widths of up to 1.5 meters. First and foremost truck tarpaulins and tarpaulins for other applications were still produced and coated. A coating system for textile fabrics up to 1.8 meters width was put into operation. Heytex starts the production of material for sport mat covers. The production of tents on polyester basis with PVC-coating follows (instead of the previous sail cloth) and also the manufacture of the first textiles for architectural applications. With the establishment of the first in-house coating system for fabrics up to 3.2 m of width, Heytex sets the course for supplying more industries to supply and for conquering other markets. Innovative highlight: With the introduction of the world's first flexible backlit for large-format digital print, Heytex enters the lucrative print media market. Heytex first expands its portfolio to add covers for swimming pools, then products for shipbuilding. And the expansion process continues: now also with oil booms and flexible containers for the storage of various liquids as well as other new products follow. With the establishment of subsidiaries, Heytex definitely becomes a global player. In 1993, Heytex Neugersdorf GmbH is established in Saxony, initially by purchasing the former company Herzog. This is where the hotmelt calendering system is used which allows to gradually include more and more highly sophisticated product groups in the Heytex range of biogas membranes, for example. At the headquarters in Osnabruck, one of the world's first 5 m high-performance coating plants is put into operation. This investment opens up attractive new outlets for Heytex, especially in the boom market of print media for L to XXL digital print. The new millennium begins with a change of location for the Heywinkel Group: The company moves from its headquarters in Osnabruck to the neighboring town Bramsche. The reason for the move is simple: The location Osnabruck had become too small as a result of the growth. Today, the headquarters of Heytex are still in Bramsche. Off to China! In 2006, Heytex establishes its second subsidiary Heytex Technical Textiles in Zhangjiagang in the Jiangsu Province. From here, not only the entire Asian market is supplied; in China, Heytex also produces its laminated textiles and fabrics for markets with less pronounced profiles. Time for change: The Heywinkel Group is taken over by North Holding Unternehmensbeteiligungsgesellschaft mbH. Restructuring measures follow and the Heywinkel Group is split up into Heywinkel Holding GmbH, Heyform Bramsche GmbH (formerly the systems & components division of Julius Heywinkel GmbH) and Heytex Bramsche GmbH (formerly the technical textiles division). The two subsidiaries Heytex Neugersdorf GmbH in Saxony and Heytex Technical Textile (Zhangjiagang) Co., Ltd. in the People's Republic of China belong to Heytex Bramsche GmbH. In Bramsche, a state-of-the-art coating system for fabric widths up to 3.2 m is put into operation. With the establishment of the third subsidiary, the Heytex Corporation in the United States, in Hendersonville, North Carolina, a second important base is created to meet the global ambitions of Heytex Group. Deutsche Beteiligungs AG (DBAG) acquires Heytex Bramsche GmbH. Deutsche Beteiligungs AG is one of the leading German private equity companies and has been a reliable partner for equity financing of successful companies since 1965. Heytex acquires the BondCote Corporation with headquarters in Pulaski, Virginia, United States and continues to focus on growth. The company, established in 1949, with its approximately 80 employees is specialized on the production of coated and laminated textiles, amongst others in the field of military, roofing, environment, agriculture, recreation and sports. With four production sites in Bramsche, Neugersdorf, Pulaski and Zhangjiagang, the Group will manufacture its products on three continents. In addition, BondCote will be in charge of sales, technology and logistics for all Heytex products in North America.